Amazingly flaky, light and tender gluten free pie crust recipe isn’t difficult to make when you use the right ingredients and follow some easy how-to steps with this recipe. Fair warning: this post is l-o-n-g not because it’s difficult to make a great gluten free pie crust, but because I want to reassure you in every possible way! I’ve written out my secrets and tips, I’ve shared my fool-proof gluten free pie crust recipe, I’ve included videos of the steps, I’ve recorded a podcast to walk you through everything you need to know to make a great gluten free pie crust, and I’ve shared step-by-step photos so you can consult this post as you make a pastry for yourself. Don’t let the length of the post scare you — it’s all here to help! Just look at this gorgeous, flaky gluten free pie crust. It’s within reach, and YOU can make it, even if you’ve never made a homemade pie crust in your life! Light and flaky gluten free pie crusts are possible with gfJules Flour! As I travel the country speaking to gluten-free groups and teaching gluten-free cooking classes, it seems that rolling out pie crusts is the one thing that scares people the most about baking. There are many techniques I’ve developed over the years, and I’ve gotten it down to quite a science! One way to easily roll out and transfer crusts is by using a pie crust bag. Another favorite of mine is using a silicone pastry mat and my favorite rolling pin covers. Together, they are so versatile and make it easy to transfer pie crusts or to roll out sugar cookies or ravioli or or or … you get the idea! Here’s a quick video of how to transfer a gluten free pie crust using a rolling pin and a silicone mat. I also have a video showing how to use these mats and rolling pin covers for rolling out GF pie crusts. But the most important trick to making a deliciously flaky and remarkably easy-to-roll-out gluten-free pie crust, is to start with the right ingredients. My gfJules™ All Purpose Gluten Free Flour is the main ingredient, and the special blend of gluten-free flours and xanthan gum gives doughs made with my flour extra stretch, making it far easier to roll and transfer top and bottom crusts. I’ve also found that a combination of butter (or non-dairy alternative like Earth Balance® Buttery Sticks or lactose free Green Valley Organics® Lactose Free Butter) and shortening makes for a flakier crust. Note: I do NOT like using coconut oil in place of shortening. It doesn’t play nicely with the flour and makes for an oily dough that is more brittle and sticky — no fun to work with! Gluten free pie crusts: the one in the back made 1/2 Earth Balance Buttery Sticks, 1/2 coconut oil; the one in the front made with 1/2 Earth Balance Buttery Sticks, 1/2 shortening. Using cold water and a surprise secret ingredient that no one will ever taste (scroll down to recipe for ingredient) also makes it easier to work with the dough, and yields an amazingly delicious crust that’s flaky and soft every time. One final thought before I let you go on to the recipe and techniques outline below: I find myself answering lots of emails in advance of pie baking season and folks are all worried that they’ll make a tough pastry crust. In answer, I usually write pretty much the same things, so I’ll copy a note I wrote recently below, in hopes that it also helps YOU make your best pie crust ever! As for flakiness of pie crust there are a couple keys, I have found. One is to make sure the butter is super cold when adding it. I like to cut it into pieces and then put it in the freezer while I’m measuring the flour and getting everything ready. When you add the butter, cut both it and the shortening into the flour/salt mixture with a pastry cutter or two knives cutting against one another, and only cut it as much as you need to integrate the fats into the flour into small balls, without working it too much. Then add the vodka or cold water (start with only 3Tbs) and mix with a fork, adding only as much more cold water as you need to get the dough to hold together without being wet. A wet dough is a heavy dough and you don’t want that! I then wrap the dough in cling wrap and leave on the counter for 30 minutes if it’s not too warm in the kitchen, or refrigerate for about 10-15 minutes if you think you worked it too much or the kitchen is warm. Roll it out and into the pie pan and then … I’ve found that covering the crust with wrap again in the pan and putting it in the freezer while you work on other things, THEN filling the crust, is a great way to keep those fats nice and cold before baking. The steam that is generated from the fats melting in the oven is what causes most of the flakiness, so if you have lots of little balls of fat throughout the crust, as opposed to melty strands of fat, it creates more flakes. That being said, overcooking the crust can also make it tough, so brush the crust with egg or oil or milk to help it brown so you aren’t tempted to leave it in the oven too long, waiting for it to brown. For even more pointers on making pie crusts, watch my video how-to or listen to my Blog Talk Radio show all about pie crusts. See below for step-by-step photos! In a large bowl, whisk together the dry ingredients. Cut in the shortening and butter using a pastry cutter (or the flat paddle attachment on a stand mixer or a food processor). Add the vodka/water gradually to make the consistency you need to form a ball – err on the side of it being wetter rather than crumbly. Don’t over-work the dough, or it may become tough when baked. Form a disc with the dough, wrap in plastic and set aside on the counter for 30 minutes while you make your filling. After allowing the dough to rest, roll the pastry out onto a surface dusted well with gfJules™ All Purpose Gluten Free Flour. Use a flexible pastry mat (e.g. Silpat) and rolling pin covers or a pie crust bag for rolling and transferring your gluten free crust easily. Gently roll in each direction — do not press down on the pin while rolling — to a circle with a diameter at least 1 inch larger than that of your pie pan. Click on the picture for this quick video on how to easily transfer a gluten free pie crust into the pan. 1- Gently lift an edge of the rolled out crust over your rolling pin. 2 -With one hand under the baking mat, use the pin in the other hand to lift the crust so that it is supported by the rolling pin as you pull the crust gently off of the baking mat. 3- Transfer gently over the pie plate to center. 4- Drop gently into the plate and press in with floured fingers. 5- Pat into your pan. For a One Crust Pie, cut the edges of the crust to an even length of approximately 1-inch larger than the diameter of your pie plate. Gently fold the edges under, then press with a fork or pinch into a fluted design between your fingers. Cover with plastic wrap and freeze while you make your fillings. For a Two-Crust Pie, double the ingredients and divide the doubled pie crust dough before setting aside. Shape each half into a disc and wrap each in plastic wrap. Repeat the rolling out steps for the first crust and cover with plastic wrap, then freeze for 30 minutes or while you prepare the fillings. Fill the pie and lay the second crust gently onto the top of the filled pie pan. Cut off all but 1/2 – 1 inch of excess pie crust from around the edge of the pan. For fruit pies, cut small slits in the center of the top crust to allow the hot steam to escape. Brush the crust with egg wash or your milk of choice – this step helps it to brown nicely. If there are any tears in your top crust, never fear! Simply take leftover crust and use decorative cookie cutters to cut out leaves, pumpkins, etc. Wet the backside of each cut-out with a dab of milk, then lay on top of any tears to cover the flaw. Use pie crust shields to prevent crust edges from over-cooking. Available in the gfJules.com store. 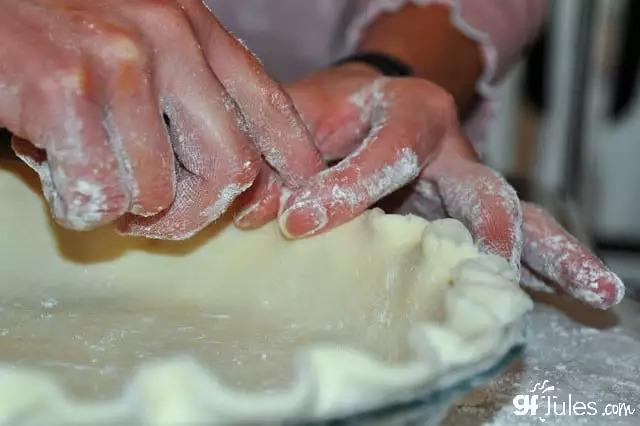 Fold approximately 1/2 inch of excess pie crust over all around the edge to form the crust, then using your fingers, press a fluted design or use a fork to go around the crust to finish. Your pie is now ready to bake or to freeze for later baking. For directions on how to freeze the pie dough and bake later, hop to my post on that method. To bake now, follow the instructions below. Single-Crust: Preheat oven to 400º F (static). Brush the crust with egg wash or milk, then cover edges with foil or pie crust shields to minimize burning. Bake for 15 minutes. Reduce heat to 375º F (static) and bake an additional 20 minutes, remove the pie crust shields, and bake an additional 10 minutes, or follow directions for your specific pie recipe. Double-Crust Pie: Preheat oven to 400º F (static). Brush the crust with egg wash or milk, then cover edges with foil or pie crust shields and bake for 15 minutes. Reduce heat to 375º F (static), remove foil and brush again with egg wash or milk. Bake an additional 35-45 minutes, or until the juices are bubbling, or follow directions for your specific pie recipe. (Cover again with foil if the crust is browning too much during the bake). Unfilled Pie Crust (Blind Bake): Cover crust in pie plate loosely with plastic wrap and refrigerate for 30 minutes. Preheat oven to 375º F (static). Prick the bottom of pastry all over with tines of a fork. Cover the pastry with parchment paper and pour pie weights, dry rice or dried beans on top to cover 1 inch. Brush the crust edges with egg wash or milk, then cover crust edges with foil or pie crust shields. Bake for 15 minutes or until the bottom of the crust no longer looks raw. Remove the parchment paper and weights. Return to bake for 6-8 minutes if filling with quiche, pumpkin or key lime type filling which will be baked further; for cream pies and refrigerated fillings, bake 10-15 minutes more. Don’t wait for the crust to turn brown before removing or it will have over-cooked. Cool completely on a wire rack before filling for refrigerated pies. See full instructions at my post on baking a frozen pie crust. Hi Kay, if you’ll notice in my recipe I do not recommend coconut oil for several reason — it does have a strong flavor, but it also tends to make the pastry dough more fragile (and hence, frustrating to work with!). Crisco works fine instead. I hope you give it a try again and do read all my tips and recommendations, as they’re there to help you make the best pie crust or pastry possible! my daughter cannot eat the xanthum gum. Is there a substitute? Hi Geri, check out this article for substitution tips! Hi Jules, it is now 2 days before Thanksgiving. In looking for a recipe for GF pie crust I came upon your site. Is your flour available in any grocery stores? Also, can I use lard for the fat? I usually use a combination of lard and butter but my son is lactose intolerant and gluten sensitive. I have coconut flour, potato flour, almond flour and oat flour on hand. No gums. Hi Elizabeth, sorry not to see this message until today – the phones have been ringing off the hook with questions! Here’s a link to stores which carry my gfJules Flour; otherwise, you would need to order it and it’s too late for Thanksgiving, unfortunately. For future reference, we CAN overnight products, so that should help. Regarding lard, that’s fine; regarding coconut oil, I don’t like using it in pie crust dough because I think it makes the pastry a lot more fragile (See my photos in this post). To make a pumpkin pie for tomorrow without a crust might be the best bet. Here’s my recipe for that: http://gfjulesnew.wpengine.com/recipes/easy-as-pie-pumpkin-pie-no-crust-needed/. I hope that helps you both have a delicious thanksgiving! So happy with th flavor of the crust which was under the filling. Rolling out and mixing went really well. The crust that rose above the filling was very crunchy. Not the crisp but tender melt in the mouth gluten crust. Is this as it should be? I. Tried not to overbake but needed to bake sufficient time for my filling to set. I used a pie shield for half the cook time. The crust was soft and pliable prior to baking. Please…help! This is the best gf crust I have tried. Is there a way to achieve a softer edge? Thanks, Jules. Yes, I used your flour blend, I used all the ingredients you listed in your recipe. I mixed lightly with a pastry blender. My dough did sit out a bit…but as my kitchen was warm I didn’t let it sit long. ;…no more than 10 minutes. It was still cold, but rolled out far more easily than any gf pie dough I have tried. I brushed the edge of the single crust with an egg wash. My maple syrup pecan filling was baked at 375 for 45 min as per directions. It could have gone a bit longer for a better set…my syrup was a bit thinner than normal this year. I so appreciate your response. My grandson is not celiac, but has true gluten allergy…as high as can be rated by bloodwork. His reaction to wheat gluten is anaphylactic. Pie is my favorite think to bake! Oh, and the pie edge was covered with a metal pie shield during the 2nd half of the baking time. I’m so glad you got back to me with the information, Cay. It sounds like you did everything right, but next time cover the crust edges for the first part of the bake — knowing what happened this time, perhaps leave them on almost the entire bake, brushing with more egg wash when you remove the covers and only bake for 5 or so minutes without the covers. See how it goes then, and be sure not to let the dough get too warm before you roll it out. Let me know how it goes next time — so glad that the dough was workable and that the recipe of the crust was good! Hi there. I am in South Africa and we do not have your gf flour here. Can you perhaps let me know which gf flours to blend to get a good result please? Hi Colette – welcome to my site! Check out this article on gluten free flours and blends. It should help you put together a solid blend from ingredients you can find locally. Happy baking! I’ve been making pie crusts for 25 yeqrs with regular flour, crisco shortening, salt, water and oil, which created a really flaky crust, now looking to create an equally flaky GF crust. Have you tried in your recipe all shortening? Does the combo of butter and shortening have better flavor?Thanks! Hi Marci, I like using some butter and some crisco both for flavor and for flakiness. They melt at different rates which actually makes an even flakier crust! I’d love to hear what you think if you try it! Thanks for responding so quickly. And yes I am going to try your recipe and will let you know. Hi Elda, I’ve actually used vodka or bourbon or whiskey and they’ve all turned out well. Try the gin! Amazing recipe using gfJules amazing flour! I didn’t have vodka, so I used gin, and the crust for my Quiche Lorraine was tender, flaky, excellent. Even my hubby (non-gf) thought it was wonderful. ???? I’m absolutely in love with Jules’ products, her recipes, and her personable responses every time I’ve had a question. Highest recommendation!! FYI, I’m going to use bourbon in my next piecrust. ???? YES! So very happy to hear it! And good to know that gin worked well – another reader was just asking about that! And yes, bourbon works deliciously, too — especially in a pumpkin pie – YUM!!!! Making a tarte tartan. Cant I simply roll on wax paper or plastic wrap. Hi Mary, I don’t find that technique easy, as it pulls against the crust. I’ve never liked doing that myself, but if you like working with wax paper or plastic wrap, go for it! Since vodka is usually grain based ( weat, barley and rye) what vodka are you using that lists itself as gluten free? I’m glad you’ve found a solution and I can’t wait to hear how the recipe goes for you, Teri! So glad you added more liquid if it was needed, Donald. And of course, SO happy you tried it and loved it!! Your site is great and I can’t wait to try you all purpose flour. What are the ingredients in your flour? I found the ingredients when reading the gf kitchen article,but now I can’t find it. I have tried 3 different brands, so far. All with very disappointing results for pie crust. Pie crust are my goal. Thank you. Hi Patricia, making pie crusts is now one of my favorite things to make gluten free! But it’s only because of my gfJules Flour. I had given up on gluten free pie crusts some years ago (after too many tears!) but with my flour blend, it’s easy to roll out and transfer the crust and it makes all my pies soft and tender. It’s just amazing. I can’t wait to for you to get to try it!!! About my flour, here’s the link to the page with all the information on ingredients (scroll down) and facts about the flour itself. Let me know if you have any other questions. You can always email us at [email protected]. Happy baking! This was the easiest pie crust I’ve ever made! Whip it up, and bust it out. I won’t avoid them any longer. Oh I’m SO happy to hear that, Beth! THAT’s the way it’s supposed to be!!!!! So happy you’ll be baking pies from now on without anxiety! Hi Jan, I would recommend just using 1-2 Tbs. white vinegar instead, if you don’t have the vodka. The rest, cold water. Let me know how that goes! Question….can I make the crust and add quiche ingredients and cook the next morning? Will the crust disintegrate because it is wet? Hi Stacy, I think I would recommend making the crust and covering it and freezing it overnight. You can put the quiche mixture in the fridge and then follow these directions to bake the next day with the frozen pie crust. Let me know how it goes!